I don’t know that I would consider myself a full-blown “watch guy,” but I’ve certainly come to appreciate some finer, mechanical wrist candy here or there in recent years. So when TAG Heuer, a brand known for making Swiss luxury watches, announced that it was dabbling in the smartwatch game, I was interested on both personal and professional levels. 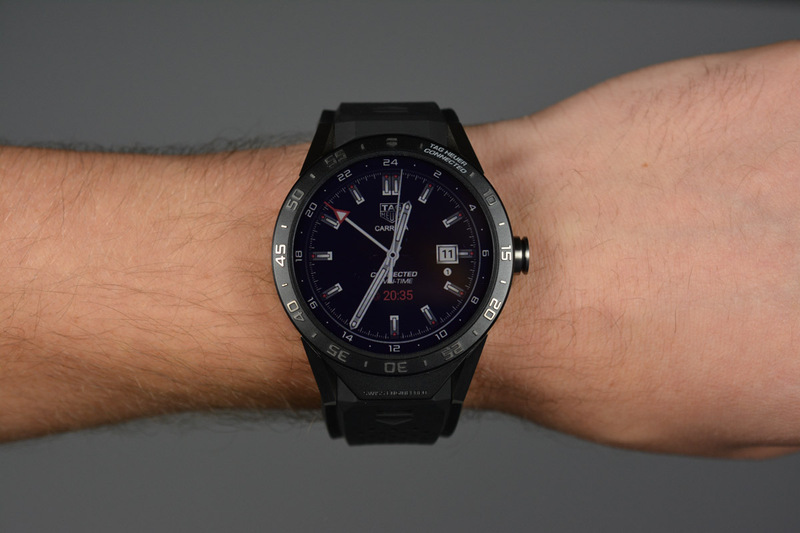 It’s not that I’m personally a fan of TAG Heuer watches (though I do own one), it’s just that the idea of a luxury watchmaker seeing potential (or threat) in smartwatches is sort of fascinating. I don’t think anyone in the Swiss watch world is scared of a Smartwatch Crisis like we saw in the 70s with Quartz, but to see one of the more well-known brands jump onboard this early is worth talking about. 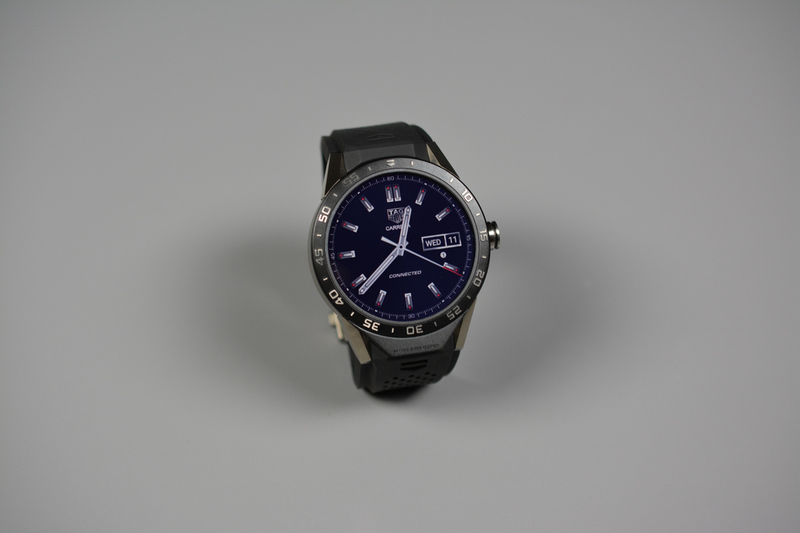 Over the past month, I’ve spent off-and-on-again time with the TAG Heuer Connected on my wrist. In other words, I’ve spent a lot of time with a $1,500 smartwatch on my wrist, but it came off and on as regularly as any of my other watches. Does that mean it didn’t win me over? Or does that mean it slotted in nicely with the rest of my watch rotation? Let’s find out. 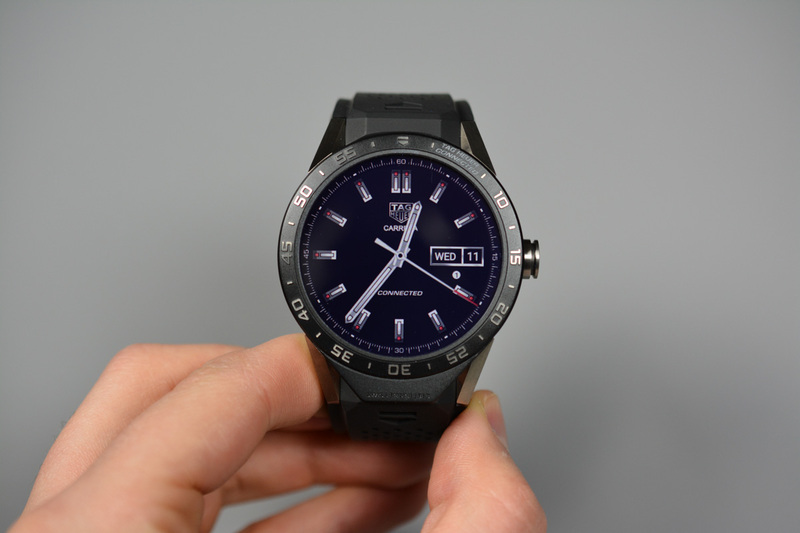 This is our TAG Heuer Connected review. When it comes to watches, I have my fair share of divers, but I also like simpler, more minimal aviation or field watches. The TAG Heuer Connected is the complete opposite of anything I would buy. This is by all means designed like a sports or racing watch, with rubber strap, titanium case, and angular, futurecar-inspired lines. That’s not to say that this watch isn’t designed well, it’s just not exactly my cup of tea. 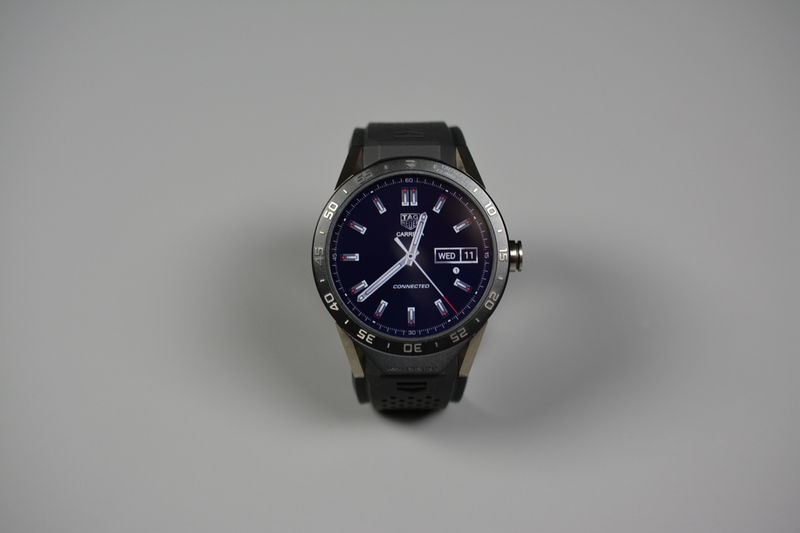 TAG has gone with a 46mm case, big 1.5-inch LCD display, fixed bezel with minute markers, and a TAG-imprinted crown at 3 o’clock. 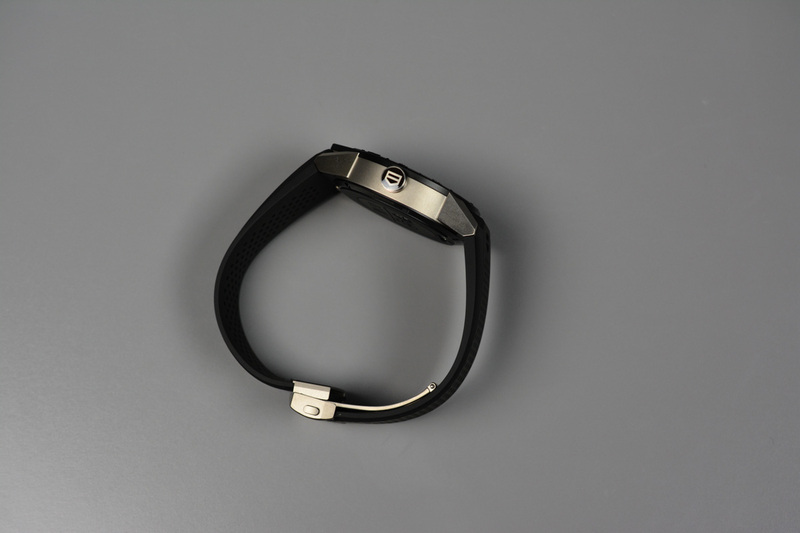 They include a Vulcanized rubber strap that comes in a variety of colors with a folding clasp that is also made of titanium. The overall two-toned look (at least with my black and titanium unit) is clean enough, though it is a large, large watch on wrist. 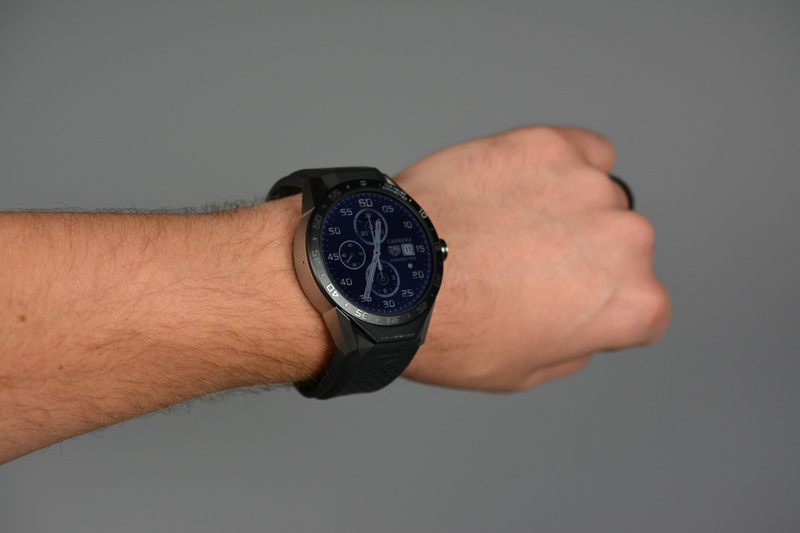 For someone like me with a 6 and 3/4-inch wrist, it tends to standout as a bulky show piece instead of an accessory. Your personality type or fashion sense will determine if that’s a good thing for you or not. I don’t necessarily have any real beefs with the Connected’s design, other than it might be too big for my little wrists and the bezel looks a bit cheap. The fixed bezel just doesn’t scream, “Hey, this is a $1,500 watch!” to me. Had they figured out a way to carry the titanium up there or maybe even left it blank, without the minute markers, it might have helped. Again, I’m not a sports watch guy on most days, but I will say that this watch fits like a dream. It may be the most comfortable of all Android Wear watches to wear, with the only rival being the Gear S2. But with this on wrist, you know that it’s made of higher-end materials than the S2, so I would choose to wear this for fit alone any day. 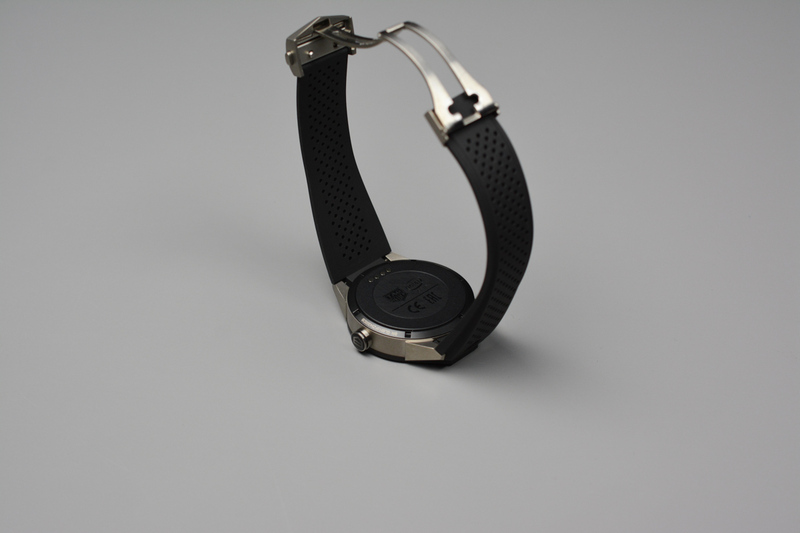 Even though it is large at 46mm, the lug angle combined with this comfortable rubber strap really allows this watch to fit to almost any wrist. Is the TAG Heuer Connected designed well? Sure, if you like the look of a Lamborghini in titanium watch form, along with an extra large 46mm case on wrist, I’d say that it is. If you like a cleaner, more minimal watch, then maybe it’s not exactly the choice for you to drop $1,500 on. 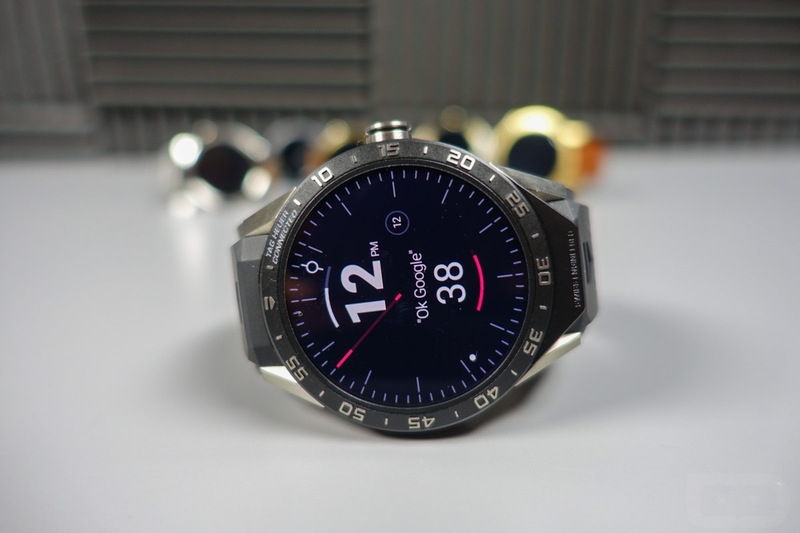 I think TAG has made one of the best fitting smartwatches around, which certainly is due at least in part to the watch’s design. If you buy the Connected, in two years, TAG Heuer will let you trade it in and then shell out another $1,500 for a mechanical watch. It’ll be a part of their Carrera line, to be exact, and should look very similar to the Connected only with an actual mechanical movement inside. Is that a good deal? Depends on your needs in two years. This is essentially TAG admitting that this watch will be obsolete before long, so they don’t want your money completely going to waste. On one hand, that’s quite nice of them, but it’s also odd that a luxury goods maker is admitting up front that their $1,500 watch will be useless in two years. Most luxury watches are bought and then kept for life, because you not only pay a premium for them, but they are genuine keepsakes that can be passed down from generation to generation. I think if you are at all interested in owning a mechanical watch down the road that is made by TAG, yet don’t have the $3K+ it would cost to get you into one of their nicer options, the Connected could be a place to start for now, assuming you can save up another $1,500 in two years. Will I upgrade? I almost feel like I have to, now that I’ve bought into this watch (that’s right, this isn’t a review unit). Then again, I’ll likely pass if the Carrera they are going to hand out is similar to this watch’s design because of my personal watch preferences. Ahhh, the price. 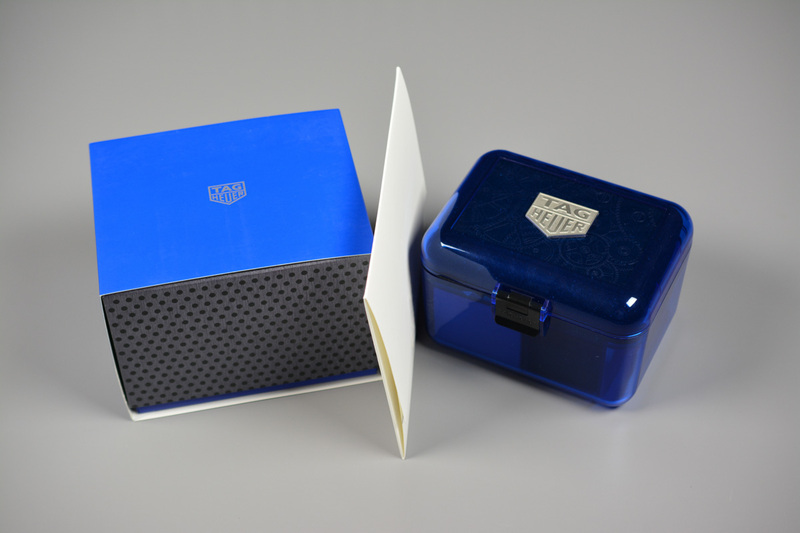 At $1,500, you get the TAG Heuer Connected with its titanium and rubber body, a good set of specs for a smartwatch (new Intel chipset, 1GB RAM, and a big 1.5-inch display), fancy bubbly blue packaging, and at least eight TAG Heuer logos. You also get to be a part of the TAG family of watch owners, if that means anything to you. Plus, you are sort of buying into a mechanical watch down the road, almost as if you made a $1,500 deposit when buying the Connected, and TAG is giving you this digital computer thing as your 2-year loaner. Is it worth paying $1,500 for the Connected, especially when the company is admitting that it won’t be worth much in two years? In all honesty, no smartwatch is worth $1,500 at any time. They just aren’t. This isn’t me telling TAG Heuer that they made a bad smartwatch, it’s just that tech moves and improves far too quickly for you to spend this kind of money on it. Well, unless you just have boatloads of money to spend on a smartwatch every couple of years. Within the last two years, people have rolled their eyes at the $300+ offerings from Android smartwatch makers, yet the highest price we have seen there is the all-gold Huawei Watch at $800. At $1,500, TAG is crushing those numbers, though I’m not sure you are even getting the same value. 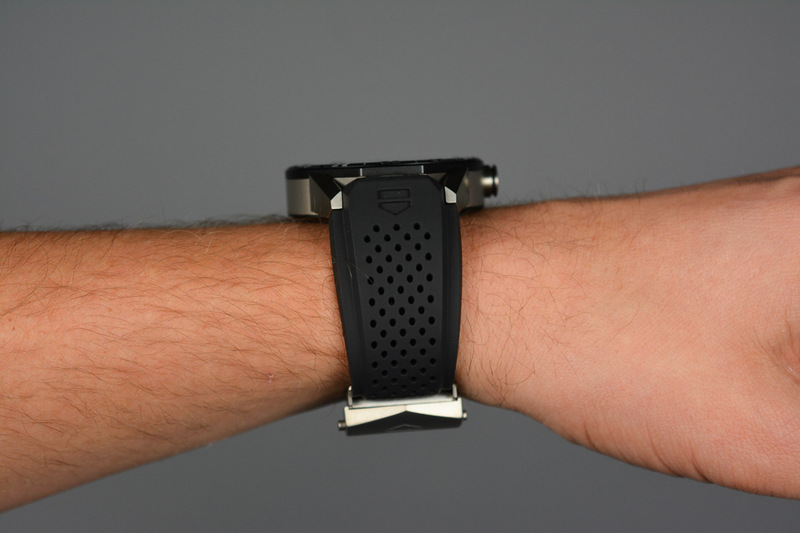 For example, this watch doesn’t have a heartrate sensor. While most smartwatch heartrate sensors are garbage, it’s most certainly missing here. What I’m trying to say is that there isn’t really anything happening here outside of the titanium case, that seems to push this above what Motorola is doing with the Moto 360 or Huawei with the Huawei Watch. You get a big luxury goods brand selling you on a product with their name on it. As for availability, you can really only buy the Connected at TAG Heuer boutiques at the moment. They were at one time selling them online too, but because of higher-than-expected demand, they are limiting inventory to their own stores for the time being. That’s a good sign for both TAG Heuer and our economy, I think. With all of that value and design talk out of the way, let’s talk about whether or not this is even a good smartwatch. In terms of battery life, it’s solid. That just means it’ll get you through a day, if not a bit more. The 410mAh battery in the Connected is on the larger side, but because it is powering that big 1.5-inch display, it isn’t going to last a week, even with that new Intel chip inside. Overall, I’ve been mostly pleased with battery life. When I was documenting battery life, I was seeing anywhere from 20% to 50% remaining at night after a day worth of use. Those big fluctuations are because of the way I use the watch from one day to the next, but either way, a full day is about right. With that in mind, the charging situation isn’t exactly ideal. The Connected charges via cradle and pins, which isn’t uncommon. The problem I have here is that because of this folding clasp, there is only one awkward way to get this watch on the charger. Once on, it basically just lays on its side, instead of propped up or in a useful position where it could be a nightstand clock or something. It does tell you the time left to charge and show you a percentage, but again, that’s not all that useful when its lying on its side. I haven’t talked about this much yet, but yes, the Connected runs Android Wear. It’s not running the newest version, which is Marshmallow, but it is up-to-date and has the latest features of all of the other Android Wear devices on the market. You can do everything you expect, like check notifications, flip through those notifications with wrist gestures, archive emails, get reminders on upcoming events, launch Google Maps Navigation, perform voice Google Searches, control music, take notes, and check the weather. You can respond to messages with your voice, which in case you were wondering, works very well on this device, maybe even better than the new Moto 360. You can ask it for your next calendar appointment with the “OK, Google” command, or you can set a reminder that way or initiate a message or turn on the watch’s flashlight. The Android Wear experience here is exactly like it is on every other Android Wear watch. Well, you don’t have a heartrate sensor or GPS, but the rest of the experience is the same. 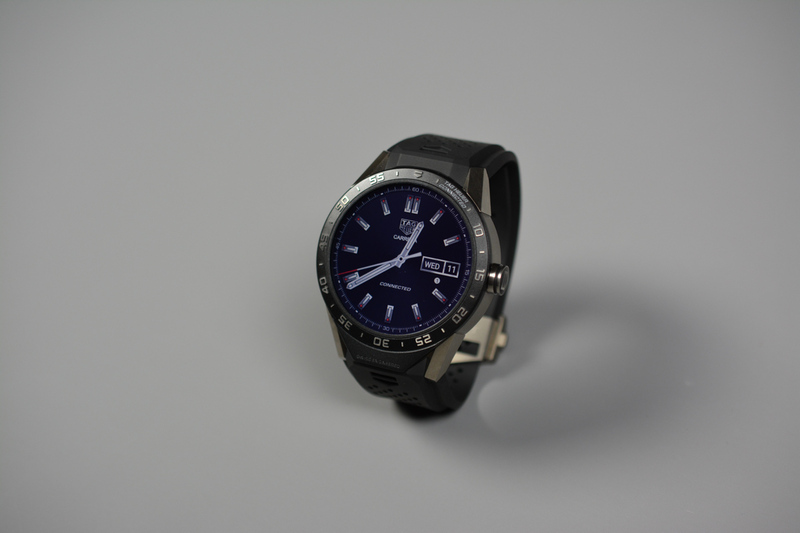 TAG has tried to make this a bit special with TAG Heuer watch-inspired watch faces. You have GMT, Chronograph, 3 Hand, and “Themed” faces that are exclusive to this device. If I’m being brutally honest, I have to admit that none look exceptional. If anything, they sort of look like low-res digital versions of real watch faces, not finely crafted watch faces for a $1,500 watch. I haven’t fallen for any and have actually struggled to find a good watch face that fits this whole sports watch aesthetic. Thankfully, this is Android Wear, so there is always going to be something new to spice up your watch, if you are like me, and aren’t typically a fan of the stock watch faces that manufacturers put on these things. As for the overall Android Wear experience, I’m very impressed with how finely tuned this watch is. The dual-core processor used is an Intel chip that we haven’t seen used before, along with a full 1GB of RAM. In the past, with other watches, I’ve grown quickly frustrated over performance, especially when it comes to voice recognition and dictation. With this watch, it’s so good in those two departments that I’m actually dreading going to any other smartwatch. When you ask the watch to do something using the “OK, Google” command, it does it almost every time. It also listens well and dictates what you are trying to say correctly more often than not. Android Wear becomes increasingly more useful when the voice aspect of it works good and I think that’s why this Connected watch has really shined for me in terms of software and performance. If anything, I hope to see more OEMs adopt this Intel chipset. Who is the TAG Heuer Connected for? I think that’s the question I keep struggling to answer over the past month. You could make the argument that a person needs a smartwatch in their life because they are the type that can’t always access their phone, yet they still need to be notified of happenings and potentially want to be able to reply to some items on the go through voice. 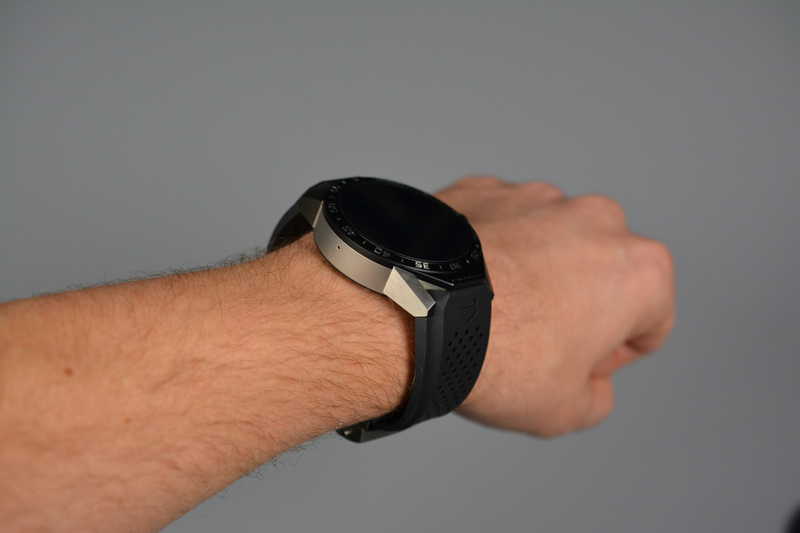 The thing is, you can buy a smartwatch that does all of that and looks great for under $300. This watch costs $1,500. So I don’t think anyone can say with a straight face that you need to own the TAG Heuer Connected. Obviously, this is a luxury good. It’s a luxury good that is a hell of a smartwatch, maybe even the best I’ve used as an actual “smart” watch. But it’s clear that with that kind of price, this is for someone who either has a lot of cash to spend without worry or is into luxury watches and also happens to be curious as to what a luxury watch maker thinks about this new smartwatch trend. 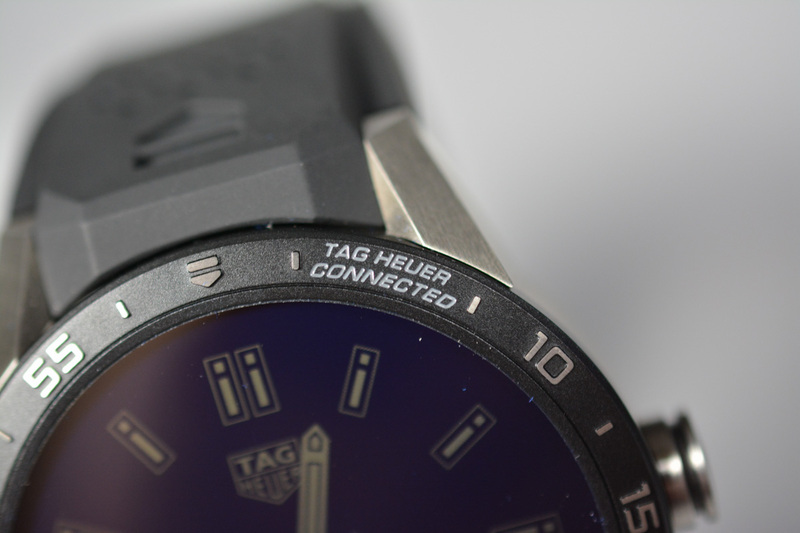 The TAG Heuer Connected isn’t going to be for everyone and it never was supposed to be. That’s 100% OK, too. The good news is that if you are a part of the target audience, I don’t think you’ll be disappointed.